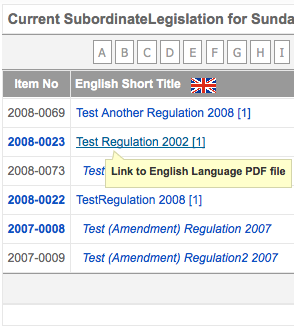 Select Legislation > Current > Subordinate from the drop-down menu in the front-end of the web site. The window displays all CURRENT Subordinate and Amending legislation arranged in a Parent/Child relationship. Under Subordinate Legislation will appear Amending Legislation (indented and in italics). Depending on SETTINGS in the back-end of the web site various rows may appear differently (see below for details). Row D - Is the LIST TABLE. It contains the list of legislation. 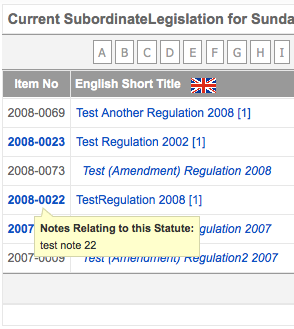 Subordinate legislation contains a number at the end of the Short Title to indicate the version number (e.g. ).The version number will only display when the SETTING point-in-time is active. Item No. Contains a number that will identify the item. Usually the number is related to the item itself (e.g. 2008-0004 is SL 4 of 2008). The format is YYYY-NNNN. The item numbers in section D can be hovered over to check the notes for the file. Items in BLUE have notes. Items in GREY do not.